It took me three moves over the course of 8 months, but I am now quite happily settled in my Hollywood Heights apartment. It’s not where I thought I’d land when I left Massachusetts last January, but it’s exactly where I need to be. I’ve already met many wonderful people here in LA through my Whispers work, my studies, and other volunteer work. The energy in my new space at The Villa Bonita is clear and light–perfect for Spirit communications and my creative writing efforts. My apartment looks out onto a lush green park and the Hollywood Hills. It’s hard to believe that the hustle and bustle of Hollywood’s theater district is just blocks away. 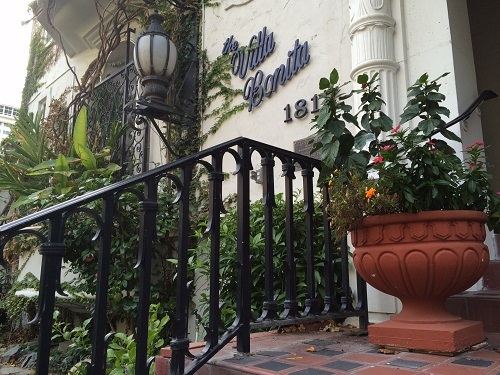 Villa Bonita is also steeped in Hollywood history, commissioned in 1929 by Cecil B. DeMille, one of the forefathers of the modern film industry. It’s been home to countless up and coming actors, writers, and industry folk. You may have heard of a few of them…Errol Flynn or Francis Ford Coppola ring a bell? I’ve been asking them to work with me from Spirit–here’s hoping! The only sad event this year was the passing of my beloved cat, Jack, who succumbed to cancer. 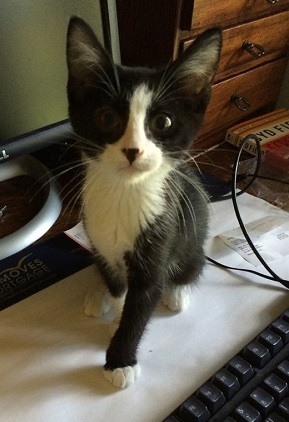 Once settled in LA, I adopted a kitten who most certainly is a soul brother to Jack (more on that later). His name is Sampson. He’s exceptionally supportive of my writing and greets all my clients is love and excitement. Can you believe the holidays are upon us once again? I love this season, and I’ve been noticing some wonderful things happening around me. How about you? In January, I wrote a post about the numerological significance and potential of a “7” year, like 2014. The primary message was simply this: in a “7” year, we are driven to shift our priorities from material to spiritual, our focus from the external to the internal, our compassion and concern from self to others. For some, 2014 was a year to seek out experiences that serve the soul’s purpose, to shed the physical and move toward a lighter, simpler existence. For others, the energy of 2014 has made it easier to generate positive karma through selfless service or paying it forward, and in doing so, experiencing the lasting joy that grows from it. What was your year like? Did you feel the shift? Were you able to take advantage of it? Did you observe it around you? I sure did. I was surrounded by wonderfully generous friends and family, helping and guiding me on my uncertain path, and to these beautiful shining souls (you know who you are), I love you with all my heart. I also observed offerings and gifts between friends that moved me deeply. As we turn our attention to the season of giving, it’s not unusual to see news reports of young children who choose to give up their own holiday gifts for those less fortunate than themselves, and even of entire families giving to charities in lieu of the tradition of exchanging gifts. Is it possible that we’re becoming a more generous society? Is is possible that those who have are finding a more spiritual connection to those who have not? It’s but a glimmer, but each year that glimmer seems to grow brighter, and it gives me hope. If the thought of donations in lieu of gift exchanges is new to you, then perhaps this year is the year you test the practice. See how your children, grandchildren, nephews and nieces feel about this practice, explaining the goals of it. Let them watch videos of other kids doing the same thing. Helping your little ones donate even a small portion of their gifts to a cause of their choosing allows them to experience what paying forward goodness and love is all about. If possible, turn the gift-giving event into something special. Take a family trip to visit the organization of choice, and allow the children to personally offer their gifts to receiving hands. Help them to see and understand how their donation will be used, and for whose benefit. Take photos to remember the event and regularly recall the wonderful feelings these selfless acts of goodness, love and generosity evoke. And guess what else this will do for you? It will provide you the perfect opportunity to help children understand that acts of goodness will return to them in mysterious and abundant ways, again and again, lifetime after lifetime… Ah, that reminds me of a favorite story from my past. I’m sure you can think of plenty of good local causes, but if you could use some help getting started, below are seven ideas to consider. You can also browse CharityNavigator.org, GreatNonprofits.org or some green causes to find a cause that makes your heart sing. 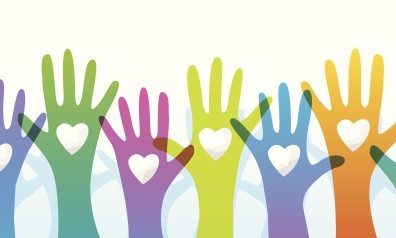 If you have a favorite charity you’d like to tell us about, please do so in the comments below. Thanks! Yes, I have gift certificates! On a final note, I’ve been receiving emails from people asking about gift certificates. 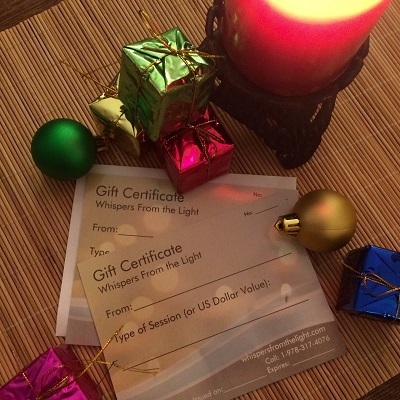 If you’d like to give the gift of a reading or hypnosis session (hypnosis sessions are in person only), please begin by deciding the service you’d like to give as a gift (See Services & Fees). Then submit the Gift Certificate form. Finally, proceed to online payment. Once payment is made, the certificate will be mailed within 48 hours via USPS, so please allow one week delivery. In the spirit of giving, any services purchased online during the month of December will receive 10% off. The actual reading may take place at a later time. Simply use discount code HOLIDAY10 during checkout and your discount will be calculated automatically. This applies to gift certificates as well. (!) International Clients: my online store will only take US-bank based credit cards. However, a new invoicing function allows me to send you an email with link for payment. So, simply fill out the Appointment Form and I’ll take it from there. Wishing you and yours a holiday filled with the love of family and friends.